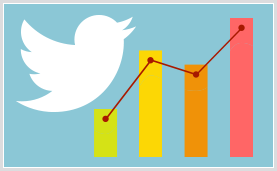 Twitter recently rolled out a new free analytics platform, which you can reach at analytics.twitter.com/about. 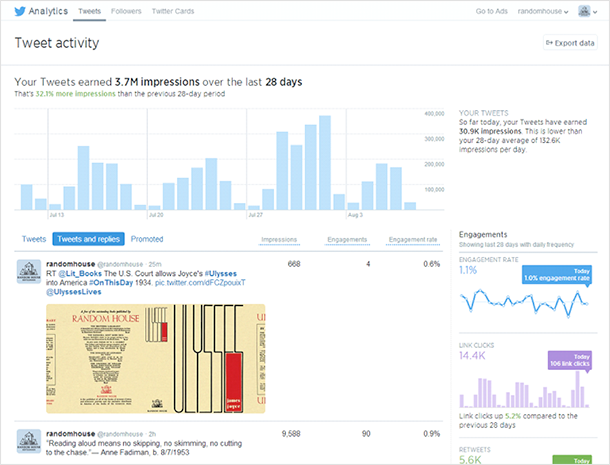 Previously, Twitter offered only very basic analytics, but the revamped page offers much improved tools, similar to Facebook Insights. The home page shows impressions (how many people may have seen your tweet) and engagements (total user interactions with a tweet—retweets, replies, favorites, follows, and clicks anywhere on the tweet). There’s a graph of impressions over the previous twenty-eight days (and how that span compares to the twenty-eight-day period before that). There’s also a sidebar breaking down types of engagement. You can export data to Excel if you would like to do more analysis (for example, to find tweets with the highest number of retweets). 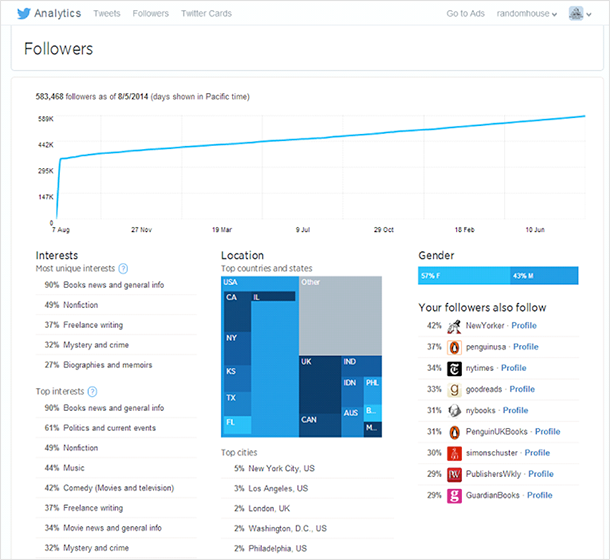 The Followers tab contains valuable demographic information about your followers, including their interests, their gender, who else they follow, and their location. This tells you a lot about who most of your followers are, helping you get to know your audience. For example, if you have a lot of followers interested in a certain genre or television show, you might consider getting more involved in discussions on those topics. Emily Hughes is a member of the Penguin Random House digital marketing team, focusing on social media and content development.